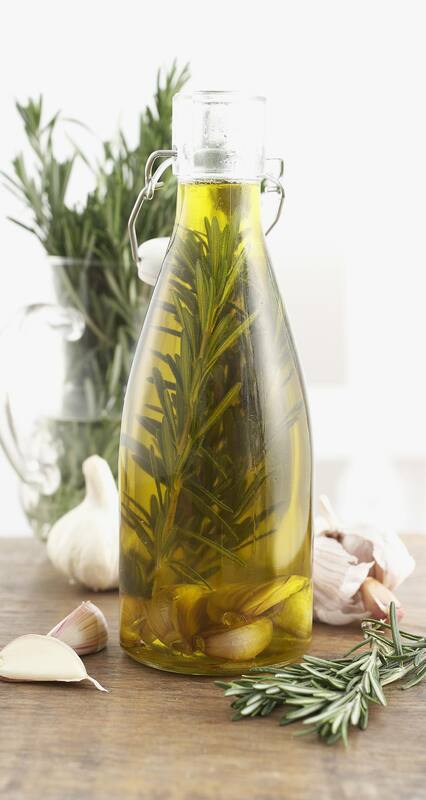 Use your favorite herbs or spices to flavor oils for dressings, cooking, or as a table . Plan ahead to let oil steep for 2 weeks. It is easy to make herb and/or spice infused olive oils at home. They make wonderful gifts for all occasions. Wash and dry your choice of herb branches and lightly bruise them to release flavor. Place them in a clean decorative glass container, cover with warmed oil, and seal tightly. Leave in a cool, dark place to infuse about two weeks. Taste. If not strong enough, add more fresh herbs and let stand another week. You can either strain the oil or leave the herbs in. If you do not strain the herbs out, the flavor will become stronger as it stands, so keep that in mind. Less strongly-flavored oils like sunflower oil and safflower oil work best to give a more prominent herb flavor. However, extra-virgin olive oil is also a good choice. If you begin with a monounsaturated oil such as olive oil or peanut oil, the infused oils should be refrigerated. These are highly perishable and can turn rancid quickly. You can also add garlic, but remove the garlic cloves after a couple of days so as to not overpower the flavor of the herbs. If you choose to leave the garlic cloves in the oil, be sure to refrigerate the oil to avoid the threat of botulism. Use your favorite combinations. Use the oils within two months. Use infused oils in salad dressings and marinades to enjoy full flavor. Herb Suggestions: thyme, basil, tarragon, summer savory, oregano, cilantro, marjoram, chervil, chives, dill, mint, parsley, bay leaf. Spice Suggestions: cardamom, star anise, juniper, coriander seeds, nutmeg, cinnamon, cumin, cloves.